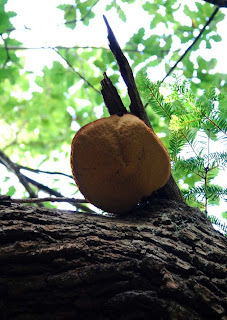 Before the Autum rains began I tried a speculative mushroom hunting expedition. 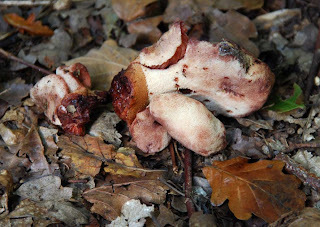 It was really a fools errand because most fungus need plenty of moisture to produce their fruiting bodies. While some prefer medows, I like mushroom hunting in the woods. Well the trip was a lovely days rambeling but resulted in few rewards appart from the discovery of this large Beefsteak Fungus, Fistulina hepatica (after the Latin fistula meaning pipe and refeing to its spore releasing tubes on it's underside that give it it's meat like texture and the Latin hepaticus or the Greek hēpatikōs refering to the liver like appearance of the flesh). 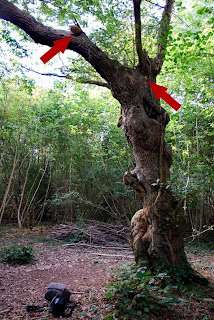 This large specimen was growing on the dead wood of an oak, though they are also to be found on the wood of the sweet chestnut. It was well out of reach and I could not safely climb to it (though that didn't stop me trying!) on my way up I found a smaller friut and satisfied myself with that! The flavour is slighty bitter and it requires long cooking but I have a robust palate and rather like it!